BREAKUP THROUGH WEATHERING AND HORIZONTAL DISPLACEMENT, Meteorites exposed on desert surfaces for longer periods, or during more arid phases, often break up along pre-existent cracks due to oxidation and volume expansion of the iron. Fragments of these meteorites are sometimes found distributed over several meters with the smaller fragments often but not always transported further away than the larger fragments. At first sight there is no obvious reason for this strange phenomenon, particularly if the find location is situated on an even surface with no hydraulic gradient. Visualizing the soil erosion process in the vertical dimension provides the answer. While breaking apart on a deflation surface over the millennia, soil is constantly removed under the meteorite and its fragments. This results in a vertical downward movement of the meteorite and its fragments. Variations in the soil composition, roots and camel grass tussocks affect the macro-local surface resilience towards erosion and deflect the downwards movement of meteorite fragments over the time. 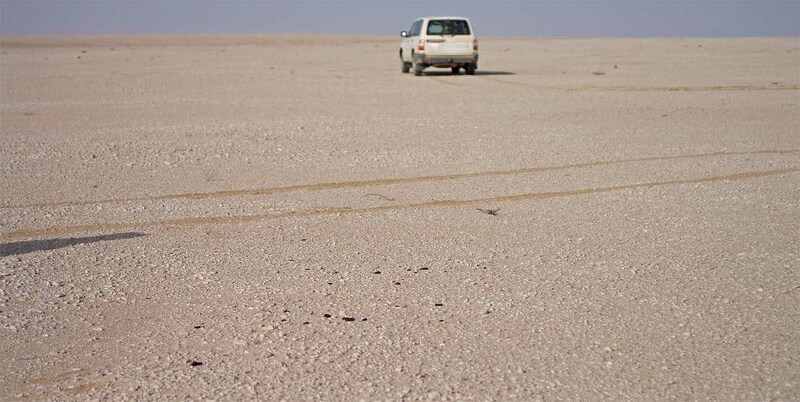 Meteorites exposed on desert surfaces for longer periods, or during more arid phases, often break up along pre-existent cracks due to oxidation and volume expansion of the iron. Fragments of these meteorites are sometimes found distributed over several meters with the smaller fragments often but not always transported further away than the larger fragments. At first sight there is no obvious reason for this strange phenomenon, particularly if the find location is situated on an even surface with no hydraulic gradient. Visualizing the soil erosion process in the vertical dimension provides the answer. While breaking apart on a deflation surface over the millennia, soil is constantly removed under the meteorite and its fragments. This results in a vertical downward movement of the meteorite and its fragments. Variations in the soil composition, roots and camel grass tussocks affect the macro-local surface resilience towards erosion and deflect the downwards movement of meteorite fragments over the time. During the erosion and deflation process temporarily local gradients, small channels and grooves can occur that further contribute to a horizontal movement of surface rocks – particularly during the periods with rainfalls. Because the final surface, in many cases an inert gravel pavement, no longer shows any evidence of these processes, the migrating meteorites are often the only signs that these surfaces in fact transform over the millennia. Another interesting feature visible on meteorites found on desert surfaces is corrasion (not to be confused with “corrosion”). The term describes the wearing away of the meteorite’s surface by natural sandblasting. Usually corrasion is found only on the windward surface of the meteorite and is mostly limited to an area not exceeding 3-4 centimeters from ground. The limitation to the windward side is an indication for a steady wind direction over the complete period of the meteorite’s surface exposure. In the Sahara and in most parts of the Rub al Khali, only the the east- or northeastern surfaces of meteorite’s display effects of corrasion. In case a meteorite is exposed for a long time and/or composed of a relatively soft lithology then the windborne sand can literally carve tunnels and deep regmaglypt-like cavities into the rock. One would think that a fusion crusted or desert patina coated meteorite is easy to spot on a bright gravel surface over a great distance. Unfortunately this isn’t the case. The advantage of a good background contrast is lost as soon as the sun is not in the ideal six o’clock position of the Viewer. Upturned rocks, pebbles, roots and other debris cast shadows that appear as black as a meteorite, causing a plethora of potential targets that all have to be visually inspected from closer distance. 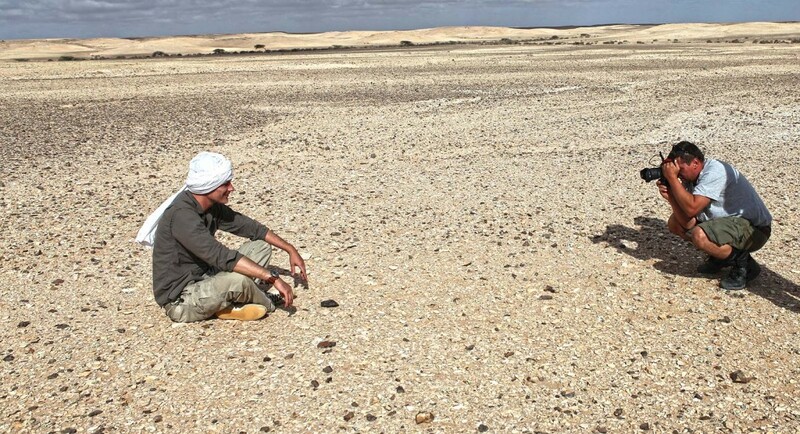 A meteorite the size of a golf ball, will blur with the surrounding in broad midday light as soon as it is more than a couple of paces away from the viewer. In fact, we have spotted no meteorite this size any further than from a distance of five or six meters. On anything smaller. you have to literally step on, in order to find it, even given ideal light conditions. In situ photos showing an ink black stone on a plain white surface often give a wrong impression in this regard. The striking contrast is often put into perspective if one steps back and pictures the meteorite in its wider surrounding. Most desert surfaces show a wide variety of look-alikes and pseudo-meteorites littering one’s search area. 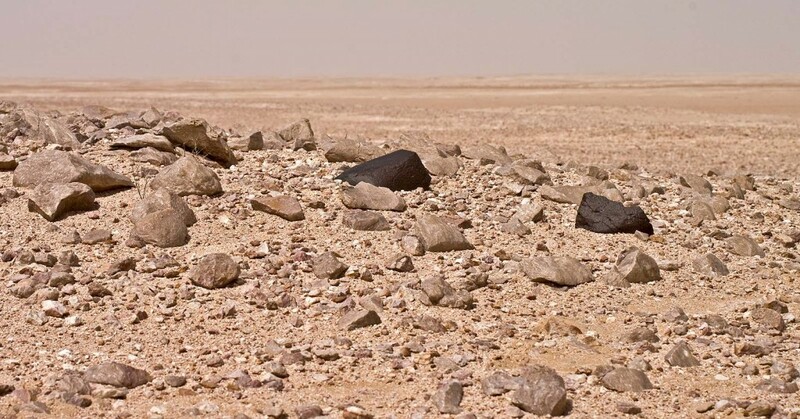 A meteorite will look no different to these dark rocks from a certain distance. Not unless the keen prospector picked up a couple of hundred of these and intimately internalized their appearances from a thousand angles during every altitude of the sun and on every surface background imaginable. Only then, he might notice the insignificant difference in an outline or the slight shade of tint that separates the genuine meteorite from its terrestrial doppelganger.